The king’s mother, Anne of Austria, had been in a childless marriage for twenty-two years before she gave birth to Louis XIV. A devout Catholic, she instilled in her son a strong sense of piety and fought successfully for his right to absolute power. In 1660, Louis married his first cousin, Marie-Thérèse, in a political arrangement. While unfailingly kind to the official Queen of Versailles, Louis sought others to satisfy his romantic and sexual desires. After a flirtation with his sister-in-law, his first important mistress was Louise de La Vallière, who bore him several children before being replaced by the tempestuous and brilliant Athénaïs, marquise de Montespan. Later, when Athénaïs’s reputation was tarnished, the King continued to support her publicly as Athénaïs left court for a life of repentance. Meanwhile her children’s governess, the intelligent and seemingly puritanical Françoise de Maintenon, had already won the King’s affections; in a relationship in complete contrast to his physical obsession with Athénaïs, Louis XIV lived happily with Madame de Maintenon for the rest of his life, very probably marrying her in secret. When his grandson’s child bride, the enchanting Adelaide of Savoy, came to Versaille she lightened the King’s last years – until tragedy struck. With consummate skill, Antonia Fraser weaves insights into the nature of women’s religious lives – as well as such practical matters as contraception – into her magnificent, sweeping portrait of the king, his court, and his ladies. I enjoyed this book immensely. As a lover of historical biographies, this was right up my alley, although I've only recently begun venturing beyond Medieval England. 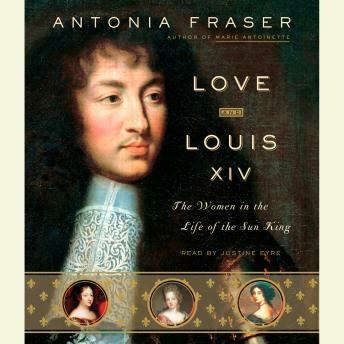 The premise of this book, a history of Louis XIV, told through his relationships with a few key women in his life, was particularly interesting as it really humanised him, showed him as a person rather than just the absolute monarch we normally read of. Don't misunderstand, you get this as well, but it's just one facet, and I felt so much more connected to him because I was able to see him through the eyes of the women he loved, and who loved him. I've read Antonia Fraser before, and admittedly I've found minor faults in her biographies of English monarchs. Not being as well versed in French history I'm unable to comment on the historical accuracy of this book. The narrator of this book did a great job. Her French pronunciation wasn't always perfect, but nor was it jarringly terrible. I'm quite sensitive to narrators who read as though they're newscasters, read too fast or too slow, or constantly mispronounce word. This narrator did none of these things. In fact, I was quite able to listen to this book and not think of the narrator at all, and that's the best praise I can offer any narrator! If you're interested in French history, King Louis XIV, or just a biography that feels more like a story than a history, then you'll enjoy this book. I know I did! Quite a vivid and detailed portrait of the Sun King--from before birth! to his death in 1777. The different voices narrating was an interesting device, but did not always work well, especially with mispronunciations of the French words. Parts were fascinating, and other parts not so much.